Why do people enjoy hosting internationals in their home? A few hosts share their thoughts. . . Skip and Vickie Larrington have been hosting Legacy’s international visitors at their Smith Mountain Lake home for 10+ years. Recently they traveled to the Middle East and connected with their “daughters” from TechGirls. Read more about their one of their recent hosting experiences. 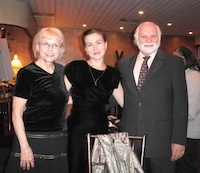 Feruza, from the Republic of Kyrgyzstan, with her host family Bill Modica and Pat Kelly. “The total experience has been fantastic: I think all of our employees have enjoyed meeting the different folks who have been here. Just getting to know who they are promotes an international brotherhood, more than anything else. We form such relationships and friendships-it’s been unbelievable! We still correspond back and forth with even the first Russian guest that we had, and that was years ago! Every one of them has been different, and every one of them has been special to us in some way. They’re so appreciative of being here, and of everything that they get to do, they just endear themselves into our hearts! We love to hear from our host families! Please leave a comment sharing your thoughts about the host family experience. Thank you!